This pole barn is a great solution for backyard storage on a budget. It has two big parking bays, behind 8'-4" wide and 8' high sliding doors, for your cars, trucks or SUVs. Another smaller bay will fit your tractor or a third car with enough room left at back for your work or hobby shop. A big open shelter will swallow up your lawn tractor, equipment, bikes, yard tools, motor toys and firewood. Pull-down stairs and a handy exterior hatch give access to a big loft for even more storage. 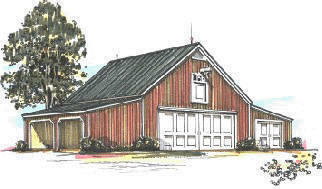 Enclosed Floor Area: 864 Sq.Ft., Open Shelter Area: 288 Sq.Ft., Loft Area: 576 Sq.Ft. Plans are $59.00 plus $5.00 for shipping, for three complete sets of drawings. The plans come with a complete money-back guarantee and include a variety of optional add-on sheds, shops, garages, greenhouses and carports that help you build any of fifteen standard layouts, including the one shown above. All fifteen of the standard layouts are shown on the plans you'll receive. You can build any of them, or you can use the main building plans and any of the add-ons to create your own custom design.